Something is stalking the village people. Across the state, the Eskimos, Indians and Aleuts of Bush Alaska are dying in astonishing numbers. By suicide, accident and other untimely, violent means, death is stealing the heart of a generation and painting the survivors with despair. A growing sense of helplessness simmers in alcohol throughout the Bush. Among a growing percentage of Alaska Natives, life has become equal parts violence, disintegration and despair. An epidemic of suicide, murder and self destruction threatens to overwhelm cultures that have for centuries survived and prospered in the harshest environments on earth. The village of Alakanuk lived on the razor's edge: a town of 550 with eight suicides, dozens of attempts, two murders and four drownings in 16 months. This was Eskimo Armageddon. At Wainwright, where four young people died in September 1986 after drinking methanol from a barrel that washed up on the beach. The dead were aged 16, 17, 21 and 33. In Quinhagak, where 11 teenagers were hospitalized and one died in April 1987 from drinking copier fluid stolen from the village school. Officials reported that a 19-year old "never woke up" from the party. In Hooper Bay, where a 16-year old boy killed himself playing Russian roulette last July. In the aftermath, his girlfriend shot herself through the mouth and was permanently damaged, and two other young women shot themselves and survived. And in grief, like that of drunken parents from Birch Creek who left a drinking session in Fort Yukon with their 2-year old in the boat and discovered only after getting home that the baby had been abandoned on a sand bar or lost overboard. Numbers scarcely begin to sketch the bounds of misery, but the numbers themselves are awful. Where 10 young white men would kill themselves, 100 young Natives will. There is roughly a one-in-10 chance that a 15-year old Native boy will kill himself or make a serious attempt to do so before he is 25. Sloppy record-keeping and a sense of shame lead to vast under recording of Native suicides; for years, they combined to mask the terrible scope of the problem. When state officials discovered the mistakes and began to double check, reported numbers of Native suicide increased by as much as 73 percent for a single year, and the full dimension of the tragedy began to emerge. Among men aged 20 to 24, the national suicide rate is 25.6 per 100,000. The best calculations available show that among white men in Alaska it is 44 per 100,000. For Native men in the age group, it is 257 per 100,000. Native women also kill themselves much more often than non-Natives. Even more tragically, they poison their unborn children. The rate of "fetal alcohol syndrome" a range of birth defects caused by the mother's drinking is two-and-a-half times the national average and more than twice the rate among other Indian populations. More than four of every thousand Native babies are born with a life sentence: retardation, damaged organs, a shrunken head, learning disabilities, hyperactivity. All of alcohol's misery is present in abundance among the village people. Where generations might once have passed without assault or abuse, families now face daily torment. "There is no serious crime without alcohol," says Alaska State Trooper George Dahl in Bethel. But there is almost no village without alcohol and none that escapes the growing epidemic of misery. Although Natives represent just 16 percent of Alaska's population and live mostly beyond the bounds of intensive law enforcement, they account for 34 percent of prison inmates. A Bethel grand jury's special report in 1986 found child sexual assault in epidemic proportions. Although their cultures traditionally have reared children in a privileged cocoon of affection and care, neglect now characterizes childhood for a growing number. "I went into a community . . . I'm not sure if the alcohol came in on the plane that I was on or if it came in on another plane that day. There were two sober adults for the entire week that I was in that particular village. That was myself and (a teacher). . . .
"From watching the kids from day one to day five, it was just incredible. . . . The children were from kindergarten up to about seventh grade. There were maybe nine or 11 children, total, in that school. "By the end of the second day, two of the children had started bedwetting, and their clothes were not changed through the entire week I was there. . . . On day three, they started falling asleep in the classroom, and the teacher just let them because they were up during the night. "It was either the last day or that Thursday that one of the parents came into the school. . . . The parent came in and it was immediate: All 11 kids went into different kinds of behavior. About three of them stood up (put their hands over their ears, and started rhythmically rocking back and forth) . . . two of them hid under tables and chairs. . . ."
Among the dead, those officially labeled "suicide" represent only a small proportion of the epidemic. "Accidental deaths" account for far more destruction. They also bespeak a carelessness for life born of deep despair. It is not truly an accident when a drunken Eskimo freezes to death within sight of his home. It is not truly an accident when a drunken man drives his snowmachine into a pair of strolling women. It is not truly an accident when a drunken fisherman falls out of his boat and drowns in the icy ocean. "We have begun believing that it is natural to die an alcohol-related death. In our minds, it has become as natural as a heart attack, a stroke or dying of old age. We have believed our own lies and excuses that drinking is a natural cause of death. "To stagger, to fall out of a boat and drown is not natural. To pass out in the snow and freeze is not natural. To fight, to knock over a lamp and burn in a fire is not natural. To abuse and hurt our loved ones is not natural. . . .
"An alcohol-related death is not a natural way to die." But is alcohol the disease or the anesthetic applied to numb a deeper malady? While it is the constant factor in all the pain in Bush Alaska, booze is hardly the only ingredient. To say that having your culture invaded and engulfed creates despair is self-evident, but it is no less true for its obviousness. The constant assault of Western institutions, Western diseases and Western economies is destroying the fabric of Native life. Western traders arrived first to exploit the bartering economies of Native people and were shortly followed by missionaries who forcefully stripped away the supporting foundations of spirituality. Preachers and teachers washed out childrens' mouths with soap when they spoke in Native language or talked about Native beliefs. Smallpox and tuberculosis ravaged adults already assaulted by change. Those people – today's grandparents– were a generation overwhelmed. Then the government took their children, sending many to "Indian school" thousands of miles away. These returned with elevated aspirations, diminished prospects for advancement and little experience in successful family living. They turned away from elders and toward alcohol. Today's parents became a generation adrift. Back in a village economy now tuned ever more completely to the need for cash electric bills, snowmachines and fuel oil cash became harder to get. But television and easier communications create an appetite among youngsters who don't fit in the engulfing Western culture or have a firm heritage to fall back on. Today's young people are a generation at risk. "Our culture has been destroyed," says Doug Modig, a Tsimshian Indian who runs an alcohol program. "We're fighting for our lives." Culture is not an item – an artifact to be lost or pawned, or a memory that might be forgotten like the words to an old, no longer popular song. It is the anchor that holds each individual to his or her place in a vast and otherwise uncaring universe. When the culture is gone, the individual stands face-to-face with apocalypse. At the core of that culture, whether adapted to the Eskimo, Indian or Aleut ways, is what has come to be called "subsistence lifestyle." In traditional Native cultures, it was not a lifestyle, but a life. Hunting, fishing and gathering were the economy, the industry and the religion. "I've been watching the villages since I left. They got TV. The men are not what they were," said Thekla Hootch, who left her childhood home in Emmonak for life in Anchorage. "Men had dog teams, they'd go out in the morning. Everybody helped each other. My grandfather would go hunt ducks and seals. "They don't do that anymore. They're on welfare, food stamps. There's snowmachines. Even though they do share, it's not like it used to be." Native men have been devalued by the changes in their culture. Economist George Rogers of Juneau recalls that even when he arrived in Alaska in 1945, a study was being done on male Native status. "There was a shift. Suddenly, a male Native was no longer a key person in the survival of his family. A young mother with kids got (welfare) payments, older people with Social Security brought in a tremendous amount of cash. The male was sort of cast adrift . . .
"In Barrow, the young men are not interested (in community college courses). Women are eager to learn. They are going to be the future breadwinners, too. This has had a devastating effect, particularly among males." Women with more employable skills migrate to towns and cities. With fewer eligible mates among them, village men suffer even worse. "When we lose our women, we lose our Native blood, and when we lose our Native blood, we lose our heart. And we drink," said a young Yupik man. With loss of their cultural anchor, many of Alaska's Native people have chosen simply to opt out. Suicide is quick from the barrel of a shotgun, slower from the neck of a plastic whiskey bottle. It is slowest of all in the lingering misery of unconnected life at the edges of existence. "Life doesn't mean what it used to in the old days," Aleut Agafon Krukoff says simply. "Some young guys from Bethel were sitting around talking," said Martha Upicksoun, an Inupiat woman who lives in Anchorage. "There was this discussion about people who have died. It was just like a war, only where the people who have died were victims of suicide or violence. These guys sitting around talking about them are saying, "Well, we made it,' and these guys aren't even 30 years old. "I mean, it isn't Beirut or Vietnam, but it's a battlefield for them. That's how they think of life, and for some of them, it's normal." The extraordinary has become ordinary in this generation. Youngsters and expert psychiatrists agree that suicide has become a standard option for many in Bush Alaska. In Alakanuk, students' reasoning turned easily to self-destruction "I can drop out of school, I can go away, I can kill myself" said high school teacher Ralph Baldwin. The life they choose to depart makes their choice more understandable. The 15-year-old who today stands at greatest statistical risk is caught in the suffocating grip of forces far beyond any individual's ability to handle. Probably he lives in an isolated village of about 300. His parents were torn from home at 13; their parenting skills were never well developed. His village elders, the centerpiece of most Native cultures, were themselves overwhelmed by white assault: traders, missionaries, fuel oil salesmen. They struggle now with representatives of cultural change their ancestors never faced: television repairmen and bill collectors and a village bootlegger resupplied by air. There may be a lot of what some villagers call "closet sobriety" in his home town, but chances are that most of the men in the village drink alcoholically at least some of the time. Binge drinking begins when a shipment arrives and ends only when the last bottle is gone. Beatings, abuse and accidents are commonplace. Death is not unusual. A legislative committee took testimony across the state. "Elders in Minto are afraid to go to bed at night when they know people in the village have been drinking. The fear comes from the knowledge that the elders would be unable to defend themselves if a drunk came into their house during the night. The elders have medical problems caused by fear and depression arising out of the drinking problems of others. "When there is a lot of alcohol in the village, children go to school tired, fall asleep during class and cannot pay attention. Children of drinkers go to school with dirty clothes, get more colds than other children and do not eat properly. These children appear to be nervous, depressed and lonely. Pregnant mothers hurt their unborn children through fetal alcohol syndrome." "Of the 82 people brought before the magistrate in 1985, all had been drinking at the time of committing the offense with which they were charged." "Alcohol can interrupt critically important subsistence activities. For example, last year two people were shot and wounded in an alcohol-related incident during the time when everyone in the village was at spring fish camp. The families of those wounded had to leave fish camp before they had finished getting the necessary amount of fish." "Within families, alcohol precipitates incidents of domestic violence and family crisis. The use and abuse of alcohol is threatening the structure of the extended family. Children and grandchildren are either excluded or exclude themselves from extended family activities in an effort to be protected from alcohol abusers." It is a grim tale, but an undeniable one. Within the heart of the ancient cultures at risk, a tentative, first response to the terrible reality is beginning to stir. A growing sobriety movement unites activists from across the state in a new campaign against alcohol, the deadly catalyst for so much Native death and suffering. Individual accountability and community unity are the touchstones of the movement that draws from traditional Indian spiritualism, contemporary self-help and Alcoholics Anonymous for its prescription. Over the next eight days, detailed reports in The Daily News will chart the depths of death and despair among Alaska Natives and look at the emerging lights of hope on the horizon. 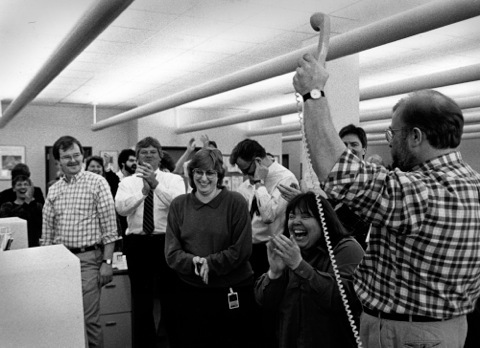 The Associated Press called to tell us we had won another Pulitzer Prize Gold Medal for Public Service.